Copy the kernel & initrd from the image to the host machine so that it can be booted. Copy the kernel command line from the /boot/grub2/grub.cfg file. (Note: Once the hypervisor is upgraded the linux16 and initrd16 directives will be supported and this manual step will not be required). [    0.001000] SELinux:  Disabled at boot. [    0.174403] no APIC, boot with the "lapic" boot parameter to force-enable it. [    0.174416] no hardware sampling interrupt available. [    0.174459] Broken PMU hardware detected, using software events only. [    0.335017] ACPI: Interpreter disabled. [   11.534356] i8042: PNP: No PS/2 controller found. Probing ports directly. [   12.668520] IMA: No TPM chip found, activating TPM-bypass! [   12.687012] systemd: Detected virtualization 'xen'. [   12.687036] systemd: Running in initial RAM disk. 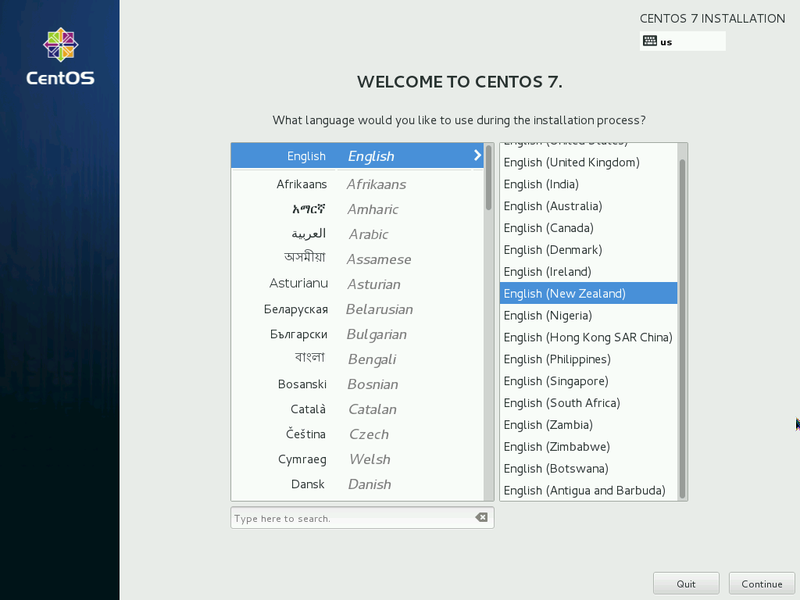 Welcome to CentOS Linux 7 (Core) dracut-033-161.el7 (Initramfs)! 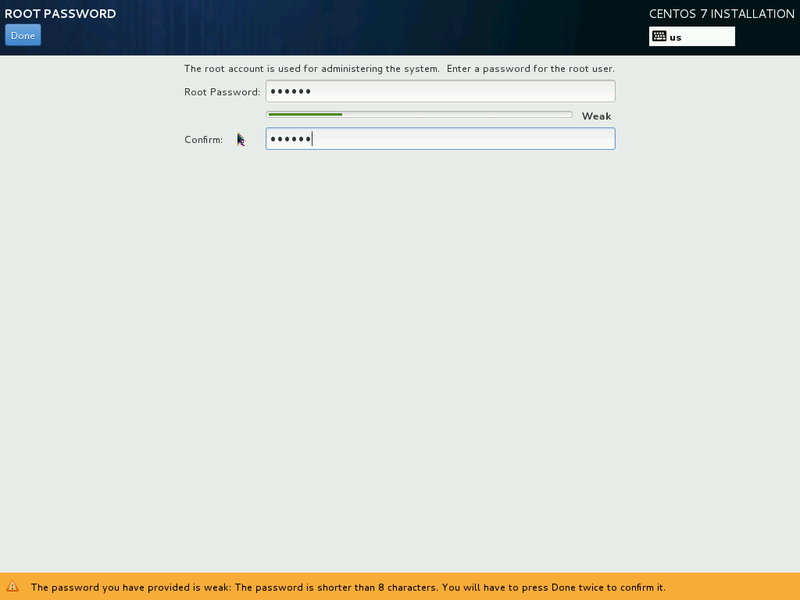 [   12.687576] systemd: No hostname configured. [   12.687606] systemd: Set hostname to <localhost>. [   12.687929] systemd: Initializing machine ID from random generator. [   12.787487] systemd: Starting -.slice. [  OK  ] Created slice -.slice. [   12.788795] systemd: Created slice -.slice. [   12.789014] systemd: Starting System Slice. [   12.789505] systemd: Created slice System Slice. [   12.789673] systemd: Starting Slices. [   12.789995] systemd: Reached target Slices. [   12.790410] systemd: Starting Timers. [   12.790733] systemd: Reached target Timers. [   12.790905] systemd: Starting Encrypted Volumes. [   12.791113] systemd: Reached target Encrypted Volumes. [   12.791291] systemd: Starting Journal Socket. [   12.791775] systemd: Listening on Journal Socket. [   12.796589] systemd: Started Load Kernel Modules. [   12.803979] systemd: Started Journal Service. [  OK  ] Started Create list of required static device nodes ...current kernel. [  OK  ] Started Device-Mapper Multipath Device Controller. [   13.283986] EDD information not available. [  OK  ] Started dracut cmdline hook. [   14.884140] Loading iSCSI transport class v2.0-870. [   15.099797] EDD information not available. [   15.124711] No iBFT detected. [   15.417096] sha256_ssse3: Neither AVX nor SSSE3 is available/usable. [   15.545621] RPC: Registered named UNIX socket transport module. [   15.545649] RPC: Registered udp transport module. [   15.545659] RPC: Registered tcp transport module. [   15.545668] RPC: Registered tcp NFSv4.1 backchannel transport module. [  OK  ] Started dracut pre-udev hook. [  OK  ] Started dracut pre-trigger hook. [  OK  ] Started dracut pre-mount hook. [  OK  ] Started dracut mount hook. [  OK  ] Created slice system-anaconda\x2dshell.slice. [  OK  ] Created slice system-anaconda\x2dtmux.slice. [  OK  ] Set up automount Arbitrary Executable File Formats F...utomount Point. [  OK  ] Stopped Trigger Flushing of Journal to Persistent Storage. [  OK  ] Started Trigger Flushing of Journal to Persistent Storage. [  OK  ] Started Update UTMP about System Reboot/Shutdown. [  OK  ] Started Dump dmesg to /var/log/dmesg. 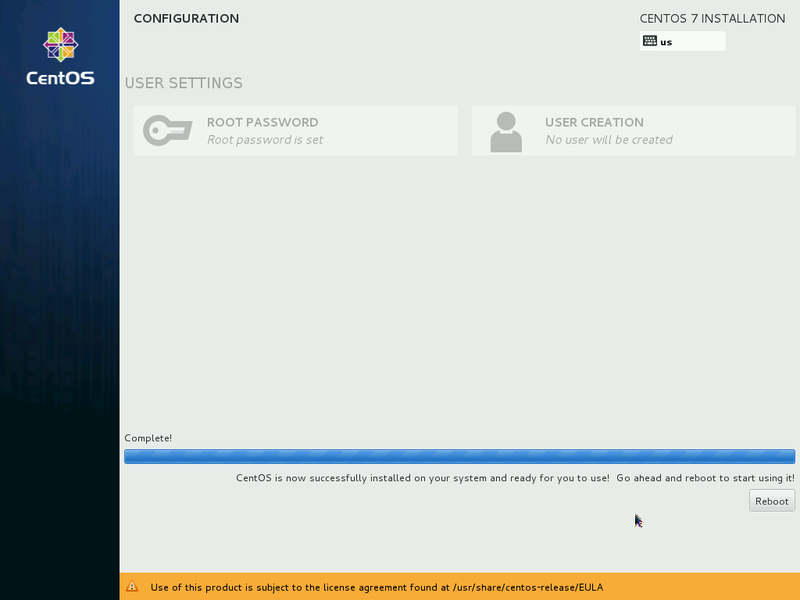 anaconda 19.31.79-1 for CentOS 7 started. 11:11:36 The VNC server is now running. 11:11:36 Please manually connect your vnc client to 10.20.1.154:1 to begin the install. [    0.000000]  RCU restricting CPUs from NR_CPUS=5120 to nr_cpu_ids=2. [    0.000000]  Experimental no-CBs CPUs: 0-1. [    0.151454] no APIC, boot with the "lapic" boot parameter to force-enable it. [    0.151468] no hardware sampling interrupt available. [    0.151511] Broken PMU hardware detected, using software events only. [    0.288168] ACPI: Interpreter disabled. [    0.497119] i8042: PNP: No PS/2 controller found. Probing ports directly. [    1.623169] IMA: No TPM chip found, activating TPM-bypass! [    1.642784] systemd: Detected virtualization 'xen'. [    1.642810] systemd: Running in initial RAM disk. [    1.643394] systemd: Set hostname to <c7.lucidsolutions.co.nz>. [    1.795569] systemd: Starting -.slice. [    1.796926] systemd: Created slice -.slice. [    1.797249] systemd: Starting System Slice. [    1.797771] systemd: Created slice System Slice. [    1.797954] systemd: Starting Slices. [    1.798160] systemd: Reached target Slices. [    1.798324] systemd: Starting Timers. [    1.798495] systemd: Reached target Timers. [    1.798685] systemd: Starting udev Kernel Socket. [    1.798990] systemd: Listening on udev Kernel Socket. [    1.799196] systemd: Starting udev Control Socket. [    1.799694] systemd: Listening on udev Control Socket. [    1.800001] systemd: Starting Journal Socket. [    1.800513] systemd: Listening on Journal Socket. [    1.801670] systemd: Started dracut cmdline hook. [    1.802799] systemd: Started dracut pre-udev hook. [    1.806627] systemd: Started Load Kernel Modules. [    1.809923] systemd: Starting Sockets. [    1.810218] systemd: Reached target Sockets. [    1.821258] systemd: Started Journal Service. [  OK  ] Found device /dev/disk/by-uuid/113c9be8-5e9c-48ee-adf8-e882ec4cdb52. [  OK  ] Started File System Check on /dev/disk/by-uuid/113c9...8-e882ec4cdb52. [  OK  ] Stopped File System Check on /dev/disk/by-uuid/113c9...8-e882ec4cdb52. [  OK  ] Started Mark the need to relabel after reboot. [  OK  ] Found device /dev/hvc0. [  OK  ] Found device /dev/disk/by-uuid/8097560d-1b8c-4fbe-963a-d54771ca2fe3. [  OK  ] Activated swap /dev/disk/by-uuid/8097560d-1b8c-4fbe-963a-d54771ca2fe3.